Plenty of Speedway coming up on various TV channels this week. (Sorry if this post is a bit long, but hopefully it will point people in the right direction) –––––––––––––––––––––––––––––––––––––––––––––––––––––––––––––––––––––––––––– The third round of the FIM Ice Speedway Gladiators series from Assen, Netherlands is on: Wednesday 19th March at 11:35AM and 6:55PM on Motors TV Thursday 20th March at 6:10PM on Eurosport Friday 21st March at 1:45PM on Motors TV and 8:35PM on Eurosport 2 Saturday 22nd March at 3PM on Eurosport 2 –––––––––––––––––––––––––––––––––––––––––––––––––––––––––––––––––––––––––––– Live broadcasts of both days of the fourth round of the FIM Ice Speedway Gladiators series from Inzell, Germany is on: Saturday 22nd March at 4:30PM on Eurosport 2 Sunday 23rd March at 1:30PM on Eurosport 2 Repeats of the fourth round are on: (Day one) Saturday 23rd March at 8:45PM on Eurosport 1 and 11:30PM on Eurosport 2 (Day one) Sunday 24th March at 4AM and 12:30PM on Eurosport 2 (Day two) Sunday 24th March at 8PM on Eurosport 1 (Day two) Monday 25th March at 12:05AM, 6:30AM, 11AM, 6:30PM on Eurosport 2 and 8:30PM on Eurosport 1 –––––––––––––––––––––––––––––––––––––––––––––––––––––––––––––––––––––––––––– There's also some Ice Speedway from the 1970's and 1980's on ITV4's World of Sport: Crazy Racing on: Friday 21st March at 6AM on ITV4 –––––––––––––––––––––––––––––––––––––––––––––––––––––––––––––––––––––––––––– The Motorbike Show also has a few bike riders trying their hand at Speedway, which is on: Sunday 21st March at 1:55AM and 8AM on ITV4 –––––––––––––––––––––––––––––––––––––––––––––––––––––––––––––––––––––––––––– Sky Sports are going to be running a series of Speedway Gold shows, which are just 15 minute long on: Sunday 23rd March from 12PM to 1PM (four shows in a row) on Sky Sports 3 Monday 24th March at 3AM and 3:15AM on Sky Sports 2 –––––––––––––––––––––––––––––––––––––––––––––––––––––––––––––––––––––––––––– Tai Woffinden is scheduled to appear on Sky Sports Game Changers on: Saturday 22nd March at 9AM on Sky Sports 1 and Sky 1. –––––––––––––––––––––––––––––––––––––––––––––––––––––––––––––––––––––––––––– Live coverage of the Elite Riders Championship from Coventry is on: Sunday 23rd March at 6PM on Sky Sports 2 Highlights of the ERC is on: Monday 24th March at 3:30AM on Sky Sports 2 Depending on how things go throughout the season, I will try and keep everyone updated of any coverage coming up on TV, if anyone has spotted a show that I haven't posted, feel free to post it to let everyone know. I can only think of the following when it comes to green in Speedway: 1) When the Speedway World Cup was relaunched by the FIM, for the first few years, there was a fifth rider in each heat, which wore a green helmet colour. 2) All 3 British leagues replaced the white helmet colour with green, just for Sky TV's betting service's benefit a few seasons ago. 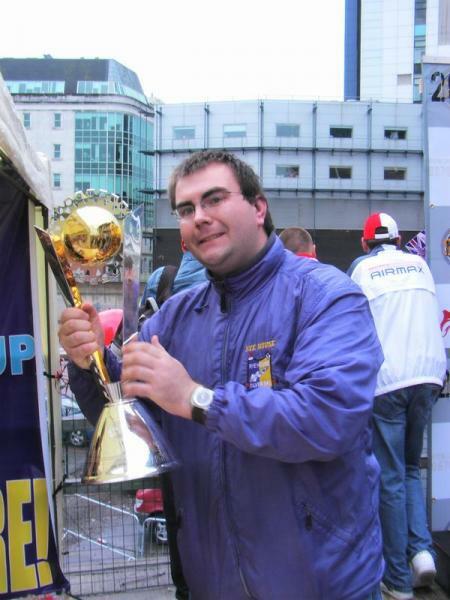 3) Simon Wigg 4) Thomas H. Jonasson 5) The best Speedway pundit ever, Jonathan Green. Soon, I'm going to have to cancel my Sky subscription, as it's gradually creeping up in price, but as Sky Sports Mobile and Eurosport Player are about £10 per month each, I'll probably switch to that as everything else I watch is either on Freeview or it can be downloaded… somehow. Should save me about £50 a month, plus more during the off-season. I've been keeping an eye on Tai ever since he came back to the UK, and was so very pleased when he joined Rye House, of course I was sad to see him go after his second season with us, but he has grown up a lot in just a few years. I know he's made a point of it before that it's his body and he could do what he likes with it, but I find all his tattoos hideous, and just shook my head when he posted photo's of his girlfriend getting a "sleeve" done on Instagram, but their choice. It's a shame really because I think that his image will put off a lot of TV people asking him to be on their shows (although he did have a good publicity run before the season started). Overall, as long as he doesn't defect to the Aussies, he can be world champ as many times as he likes. I think Sam Ermalenko put it best, that if Nicki made a point that it was his fault rather than running over to his bike and riding as if nothing happened, it might of ended up differently. Speaking of "red card" incidents, does anyone remember the Ben Powell incident at Newcastle back in 2008, now that deserved a "red card". I remember my one and only visit to the Hayley Stadium for the Prince of Wales Trophy the day after the 2003 British Grand Prix, it was about halfway through the meeting, and during the interval, the tractor was out grading the track, upon it's last lap of grading, the driver turned right as he wasn't looking where he was going, straight through the safety fence. Which is the best track you have been to? Exeter, it's been a few years since they went but I was just fascinated to see bikes going flat-out for all 4 laps. Which is the worst track you have been to? Arena-Essex/Lakeside, I've yet to see a good race there out of the hundreds of times I've been there. Which has the best food you have tasted? Rye House (2002-2008), it really was decent fish & chips. Which has the worst food you have tasted? Rye House (2008-present), I know that they've changed suppliers, but it's just not as good as it once was, I do feel sorry for the away fans who try it out these days. In terms of facility's ie toilets, seating, access which is the best place you have visited and worst? Best: Cardiff, I know it's a temp track but it's a whole day event, great city for walking around in, every seat is a great seat in the stadium, although the toilets do get very crowded before and after the Grand Prix. Worst: Arena-Essex/Lakeside, sorry Hammers fans but there's no good places to see the whole track, the toilets are too scary for me. Sorry for not posting anything so far this week, as the Sky meetings have been on Tuesday this week and will be Tuesday again next week, I'm just delaying what I post. I should get next weeks screenings up later tonight. How Many Tracks Have You Been To? Arena Essex/Lakeside Rye House Hackney/London Stadium Exeter Wimbledon (but not on a race day) Eastbourne Sittingbourne Newport Cardiff (Millennium Stadium, 12 times) Poole Ipswich Mildenhall Peterborough Not sure if this counts, but I've been to where the Rayleigh stadium used to be, as it's only a mile away from my house. Plus I am hoping to see a Polish SGP/League meeting either this year or next. Well, I don't really want to say what I'm using exactly but what I will say is that what I am using is free. I remember that too, and it was pretty recent, but I can't quite remember who was involved. But if he was replaced by a guest, he wouldn't have his name on both sides of the scorecard. I did hear a while ago that a former SGP rider was complaining that one of the reasons that the FIM want everyone to wear leathers is because Armando Castagna (who is one of the officials in the Grands Prix these days) owns a large stake in a leather company in Italy and that he's pretty much doing the same as Briggs with the whole dirt deflector thing. I seem to remember being told that Alan Mogridge was the only rider ever to be declared for both the home and away team in the same meeting, obviously as rider replacement for one team and actually riding for the other. My apologies for not posting any updates last week, it's just that my online TV Guide that I use to find anything to do with Speedway had recently changed and couldn't work out what was on and when, but now I can tell you what's coming in the next 7 days. Starting with repeats of the opening round of the Speedway Grand Prix season from New Zealand, shown on the following dates and channels: Wednesday 16th April at 11:15AM on British Eurosport 1 Friday 18th April at 9AM on British Eurosport 1 and at 7:30PM on British Eurosport 2 Monday 21st April at 8:45AM on British Eurosport 2 _____________________________________________________________________________________________________________ Eurosport is also repeating the first and third rounds of the European Championship, first round from Gdansk, Poland at the following time: Thursday 17th April at 9:30AM on British Eurosport 2 Third round from Gorican, Croatia at the following time: Sunday 19th April at 7:30AM on British Eurosport 2 _____________________________________________________________________________________________________________ Wolves Vs. Aces can be seen LIVE: Tuesday 22nd April at 7:30PM on Sky Sports 2 and repeated: Tuesday 22nd April at 11:30PM on Sky Sports 2. Speedway on TV 2014 (Live meetings will be highlighted in red and bold text) - 25th-31st March The Ice Speedway Gladiators series conclusion is on both Motors TV and Eurosport this week at the following times: Thursday 27th March at 8PM on Motors TV Friday 28th March at 3:40AM and 4:50PM on Motors TV Saturday 29th March at 10:05AM on Motors TV Sunday 30th March at 8PM on British Eurosport 2 Monday 31st March at 12:40PM on Motors TV The first round of the Eurosport Best Pairs Championship will be on Eurosport this week at the following times: Friday 28th March at 6PM LIVE on British Eurosport 1 Saturday 29th March at 9AM and 4:30PM on British Eurosport 2 and at 7:45PM on British Eurosport 1 Sunday 30th March at 9AM, 7PM and 10PM on British Eurosport 2 Monday 31st March at 12:30AM and 4:30PM on British Eurosport 2 and 7PM on British Eurosport 1 It's also worth noting that those who have Sky's On Demand service can download the Elite League Speedway Preview show on their Sky+ boxes until Sunday 30th March. I am aware that some betting websites are showing live speedway, but they won't be on TV, so they don't really count for this thread. I have no idea what this has to do with anything. Just to be clear, I will try and post a schedule of Speedway on TV on Tuesdays, as it's plenty of time to get people ready to set up their Sky+/Virgin Media/PVR boxes for the week coming. That's a good idea, but I shall be just keeping it to TV listings as it keeps to the subject title of this thread, but if someone is willing to do a "Speedway on Radio 2014" thread, I would welcome it. Yes, I had seen that, I was going to post about it next week as my Sky box can only go 7 days ahead and it might lead to a little confusion where people might think it was this Friday. But thanks for posting that, I do encourage everyone to point out something that I may of missed. It is pretty poor, but it's the only proper game out there. I was lucky enough to get it for 97p, but I have many other games to play.